I found this neat little book in a thrift store. The book is still in print. China Books was founded in 1960 by a Christian missionary with the intention of distributing controversial material from the PRC in America. They are known for publishing an English translation of Mao’s Little Red Book in the US. They are now owned by a Chinese publishing conglomerate. 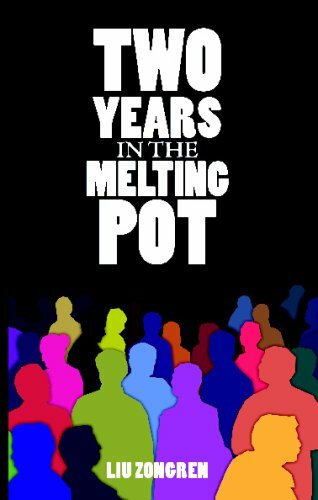 Their website claims that Two Years in the Melting Pot is still one of their best sellers, aided by the fact that it is often assigned as a text in something called "cross-cultural studies" programs. Much of the book focuses on Liu’s experience being separated from his wife and son. After a few months, he actually requests a transfer from the prestigious Medill School of Journalism at Northwestern and stuffy Evanston to the University of Illinois campus in the city in order to have a network of Chinese to fall back on and to experience dat Real America. He is invited to all sorts of social gatherings from people at both schools. He uses his contacts to visit a large family farm in Missouri. He befriends a theology student at a Crusade for Christ demonstration at the Daley Center. He is comically oblivious to a pretty obvious sexual advance from a woman in a borderline cultist “intentional community” in downstate Illinois that still exists called the Stelle Group. He travels with employees of China Books to staff an exhibit at a world fair in Knoxville, Tennessee. All along the way, he meets random Asians. One chapter is devoted to his impressions of the Asian Americans—Mainlanders, Hong Kongers, Taiwanese and Japanese—he encounters. The book was positively reviewed by several major US publications, including the NY Times. 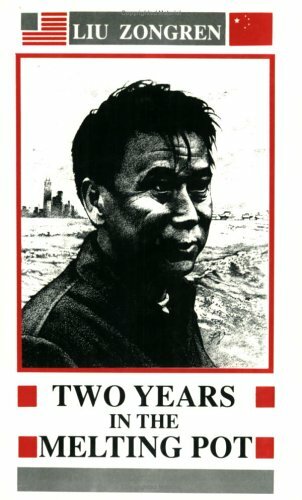 The Christian Science Monitor called it “Tocquevillian.” In 1989, the year of the Tiananmen Square protests, he published a second book, also in English, about his experience in a labor camp at the end of the Cultural Revolution period that was panned by the NY Times here. I met my first real American friend one afternoon when I went to Professor Thompson’s office for a conference and found him talking to Victor Valle, a 34-year old Mexican-American student. Professor Thompson introduced us and after talking for awhile, Victor invited me to his home for dinner on the weekend. There I met Mary, his wife, who had a Chinese grandfather, and who seemed glad to welcome me every time I visited. In my talks with Victor, he advised me that I should learn to be “aggressive” in this country, or I would get nowhere. How to be aggressive? It took me all of a year to understand how to be that way. Through Victor I received my first invitation to a Professor’s home. Victor told me one day when we met on campus that Jay Harris, a talented black professor at Medill, wanted me to come to his home for dinner. I was flattered to have a personal invitation. The next day an attractive black woman in her early thirties stopped me in the corridor and introduced herself as Christine, Professor Harris’s wife. She was also a professor at Medill. She described to me where they lived and how I could get there. She even offered to pick me up in her car, but I told her I would come by bicycle. The dinner was to start at seven o’clock. I set out on my bike at six and rode south along the lake front. Dusk was falling when I came to a dead end. I looked at the numbers on the building doorways, but I was lost in the darkness. I asked directions from two people walking along the lake, and they said that 497 Sheridan Road, the Harrises’ address, was twenty blocks south. This didn’t make much sense to me—how long was a block? It was a minority get-together: Victor, a Mexican, and his wife, Mary, a Mexican with a Chinese grandfather; a Chinese-American named David; the black Professor Harris and his wife, Christine, herself a black with German blood; and I, pure Chinese. The subject that inevitably arose before the evening ended was the treatment of minority students. Victor had a lot to complain about, but I had been in the United States for too short a time to take a position. That evening we also discussed the matter of ethnic identity. I asked Professor Harris how he thought of himself, as an American first, or as a black first? After a moment’s thought he said, “Black first.” I could not understand why American blacks searched for their African roots. After all, they had been born and had lived in the United States for many generations. They were not newer than any of the other peoples, and they had a large population. To an outsider it seemed that blacks would be better off if they were to put more stress on educating their own people and less on blaming others for their lack of opportunities. I later asked a black woman who was a guest speaker at Northwestern, “American blacks are Americans. They have lived in this country as long as whites, American culture is their culture—why do they think they are different from whites?” My question was well-intentioned, my thinking that people who have shared a culture for so long should have a common feeling for it. She said I was right to some extent; blacks should take American culture as their own, but in American culture there is a lot of prejudice against blacks. “Do you know who has the power?” she asked. I didn’t. She didn’t tell me how. After a year’s stay in the United States I knew the country better and realized she was telling the truth. Although Chicago’s population is 40 percent black, I didn’t see many black students in the universities. Most of them lived in the poverty-stricken inner-city ghetto. Many of them have lived on social welfare for so long that they have lost a sense of value for education and work. Sometimes I suspected that the ruling class was deliberately keeping black people in an inferior position to whites. February was full of momentous events: The assassination of John Lennon was still in the news; Ronald Reagan became president; and the American hostages were released in Iran. I sat in front of the TV for hours every day. How remarkable the scenes in Washington were, as the triumphant Reagan took his vows and the pitiful Jimmy Carter left the White House almost unnoticed. The highlights of Reagan’s inauguration was the release from Tehran of the hostages. Reagan, the actor, as well as the man and politician, appreciated fully the drama of the homecoming. Carter must have cursed his own rotten luck. Why hadn’t the Iranians released the hostages one day earlier? What a face-saver that might have been. I sympathized with Carter. In thinking about what to do with my future here, I had come to the conclusion that what I needed was a bridge person, one who could close the gap for me between the culture of China and the United States. There were a thousand things I was eager to know. The rest of my time in the United States would hardly be long enough to learn about the culture. I didn’t want to be confined just to a classroom. I could take a hundred books back to read in my own country, but I couldn’t take people with me. I had to know them here. When we first came from China we all had friendly feelings for blacks because the Chinese news media regularly reported on how our black brothers in the United States were oppressed. But, after a couple of months of living next to a black neighborhood, we began to develop a fear of them. When we were out walking, we tried to avoid the housing project inhabited by blacks. Half a year later, in an interview, I told a newspaper reporter that it seemed as if our black neighbors hated us Chinese, and that I believed social welfare took away the dignity of poor people. In print the statements sounded racist. I should have made it clear that among people of any race and nationality there are good and bad; that we happened to live near a black housing project where there were a few bad youngsters; and that I had good black friends who wanted to help me understand the situation of their people. I felt uneasy about this interview, and I was concerned about what my black friends would think of me. One black friend made the comment, “I was not happy reading what you said about blacks. But, at the same time, I am frustrated because I realize that you are telling the facts.” I was particularly worried about offending one friend, a black woman on the faculty of a nursing school who had been a great help to me in Chicago. Fortunately, she was away in San Francisco when the article appeared in print. When she returned and asked to see the article, I told her I hadn’t kept a copy. That was true; I felt guilty about the remarks I had made about blacks and didn’t want to keep a copy around to remind me. It took two months to build up enough courage for me to tell her about my remarks on American blacks. She understood. She said she was also cautious in certain black neighborhoods. The question, she said, is who is responsible for this? I was later to give a great deal of thought to that question. Back in 1974, when I had read Gone with the Wind, I sympathized with Scarlett; I admired her courage and thought she was sensible in her treatment of black slaves. But a white American woman working in my office gave me a copy of Jubilee. “Read this, so you won’t have such a one-sided view of American history,” she said. Jubilee is a novel about how a slave family fought for its freedom and independence after the Civil War. I read it and afterward thought I then understood better the other point of view. After a year in Chicago, where the population is 40 percent black, I was forced to see both sides. My sympathies went out to the inner-city blacks who lack an opportunity for a better education and, as a result, better job opportunities. My sympathies also went out to the middle-class people who are afraid, and who have to pay the taxes to support the social welfare system. I didn’t like this kind of social welfare, not because people complained about paying for it, but because I believed it deprived the recipients of appreciating the value of an education and of work. Three times during that summer Barbara invited me, the Chinese woman, and one of my roommates to her father’s house on North Sheridan Road in Glencoe. As we were driving there on our first visit, I became aware of the fact that from Evanston north, I had seen only white people. The only dark faces here were white ones tanned by the sun; the only oriental faces were those of we three Chinese. We stopped at a grocery store in Winnetka, a suburb north of Evanston, to buy some food. Out of habit, I began to roll up the car window; Barbara gestured for me to leave it open. “That’s not necessary here,” she assured me. We didn’t even have to lock the car, and to test the safety of this place, I left my camera on the car seat while we went into the store; it remained untouched. One evening, after an early supper, Al drove me to see the Missouri River, which joins the Mississippi. I had read Mark Twain’s Life on the Mississippi and had been fascinated by the scenes he described. Originally I had intended to stay in St. Louis for a day or two on my way here, in order to see the Mississippi, but I had nowhere to stay, and the blackish water and dirty surroundings I saw from the bus as we entered St. Louis dulled my interest. Now in this part of Missouri it was easy to visualize Mark Twain’s life a hundred years earlier, with its wide flat land, wild woods, and turbulent waters, still seemingly untouched by humans. Twain’s landing places for steamboats are missing, but a railroad runs along the side of the river, passing grain bins at desolate stations. On my first Sunday morning at the farm, I went to church with Mr. Swisher. I was moved when he solemnly thanked God for having a Chinese visitor in their home. At the Sunday family dinner, Mr. Swisher’s ninety-one-year-old mother, his brother and wife, and two of his sons’ girlfriends were guests at the table set in my honor. The grandmother said a prayer before the meal, once again thanking God for my visit to her family. It was tempting, even for one as strongly influenced by atheism as I have been, to join in the calm and good feelings brought about by the family’s religious practices. My visit to Marshall gave me a chance to meet people in the community. I was invited to speak to a breakfast meeting of the Optimists Club, a local businessmen’s and farmers’ organization. I like the club’s name; I hoped people all over the world would be as optimistic about the future of the world as these people seemed to be. At the meeting Mr. Swisher said that everyone throughout the world should have the same language so that people could understand each other better. He also said I was their first visitor from the People’s Republic of China, and that my stay made it possible for them to know more about China. I told the club about my work in Beijing and about the life of Chinese peasants. They asked a lot of questions: Is every Chinese a Communist? Are there rich people and poor people in China? Does China have a welfare system like the one in the United States? How do the aged people live in China? I told the club members that there are no television stars, football players or plastic surgeons who are paid tens of thousands of dollars in China, as there are in the U.S.; and that a Chinese minister of state makes about two hundred dollars a month, only three times more than a skilled factory worker. I said that our people are not starving; we “ration” what food we have, which is not much. Perhaps this is why China does not have many overweight people. I said that diet pills were strange to me. In China I had never heard the term “on a diet.” I also told them that Chinese people are hardworking people. If we had as much rich and arable land as there is in the U.S., the Chinese people would probably produce more than American farmers do. I concluded that at first I thought the United States was so rich because it had such advanced technology and science. But now that I had come to Marshall and seen the rich land, I thought that the prosperity came from the earth. The surplus wealth from the land supported the manpower needed to develop science and technology. The audience seemed to appreciate my talk. They thanked me and invited me to return to Marshall again in the future to tell them more about life in China. I had only one disturbing experience during my visit with the Swishers, as Al and I were driving home from the Missouri river. We saw a group of people walking in the dark along the highway. I asked Al if they needed a ride and he turned the pickup around. The group, who were desperately hoping someone would give them a lift, turned out to be a family of three adults and three children—two young girls under thirteen and a boy around seven. They asked us to drive them to a crossroad where they might be able to hitch a ride. They had hitchhiked all the way to Missouri from South Carolina, looking for odd jobs on farms. They had by now spent all their savings. Al and I each gave them ten dollars, hoping they would have a hot meal and a roof over them that night, then dropped them off at the crossroad. The older girl, about twelve, waved to us in gratitude. My heart ached seeing this lovely girl, dog-tired and face smeared with dirt. I asked Al why he couldn’t have given them work, since the Swisher farm needed a lot of farm hands. “It’s too expensive to hire people,” Al said thoughtfully. Why, I asked myself, can’t the country deal with its migrant worker problem? The United States is such a rich country that I wondered why there are still people as poor as this. I don’t want to imply that all television shows are bad, or that most crime stems from TV. As a matter of fact, I liked the greater part of what I saw. I liked the news programs on all channels; Walter Jacobsen’s “Perspectives” and Ted Koppel’s “ABC Nightline” were my favorites. I also liked Johnny Carson’s jokes, and the “Wild, Wild World of Animals” on public television never failed to arouse my admiration for the people who take such marvelous pictures. From “Nova” I acquired as much knowledge in a few hours as I might by reading volumes of books. And when I was watching “You Asked for It,” I usually wondered how much money they had to spend sending their reporters all over the world. In using television as my English class instead of as entertainment, I didn’t care whether the programs were old or new, or what the contents might be—even the commercials proved of help, since they were repeated hundreds of times. This aided my pronunciation just as the tape recorder did when I played again and again the phrases that had been taped at the Speech and Hearing Clinic. Through TV commercials I also came to know many things that I would otherwise never have learned. For example, it would have been embarrassing to ask a salesman what those egg-shaped objects on the store shelves were. The TV commercials clearly said they were L’eggs—“pantyhose as smooth as silk.” On the screen, the high-stepping dance of a pretty girl showed that this pantyhose would come to the top of a woman’s thigh. Almost every half hour a dog-food commercial would come on. A voice would say, “Come and get it,” and then the dogs on the screen would begin barking, running and jumping, while the off-stage voice enumerated the virtues of the dog food. Next, there would be a commercial for diet pills. It was a matter of curiosity to me why the women in the diet commercials were always very slender before taking the pills. I was also curious as to why Americans encourage dogs to eat more but humans to eat less. In America, the overriding need to be recognized as an individual is so often expressed in the way one dresses. The exceptions are the teenagers who choose to dress alike and happily submit to the styles dictated by their peers. Parents and schools may not approve of certain fads in clothing yet they find it virtually impossible to control the dress codes. Other than the teenagers, I discovered no restrictions on how people should dress. I never saw two persons dressed identically, except by choice; the businessmen and bank workers on LaSalle Street dressed in three-piece suits and ties, all wearing their wing-tipped shoes. Still, they had enough variety in their outfits to appear different from one another. A young professor at Circle wore a different tie and shirt every day, even if he wore the same suit. With all the clothing changes they made every day, there was little chance that two professors would show up looking alike. I laughed, not at my two colleagues, but at people who spend time worrying about what clothes they should wear. It is a waste of time for people to fuss over clothes, and it is also a waste for Chinese to try to find ways to restrict others’ manner of dress. I hope that Chinese society will become more open, as America is, about the matter of clothing. A few western suits and blue jeans can hardly change centuries of Chinese teaching—history has already proved that. A billion people are like an immense ocean which can easily accommodate a few drops of foreign pigment without changing color. Western life is very appealing to many young Chinese today, who think that a better life can be achieved by adopting western life-styles. Let them try—they will soon learn. About three dozen people came to David and Robin’s baby shower. And I immediately noticed there were no black or other dark-skinned people. David introduced me to several young people and others came up to me. I asked what jobs they had. Mostly they were nonprofessional workers, such as carpenters, store clerks, or truck drivers. They were more openly curious about me than people I met at parties given me by my professor or journalist friends. I was not as impressed by the many gifts for the baby as I was by the friendly atmosphere. There was a sense of closeness—brotherhood, as David and his religious friends called it—but also a lack of intellectual sophistication. On the few occasions when the three women from Taiwan and I got together, we talked about China. We hoped that China and Taiwan would eventually end their hostilities and join together to make China strong. Taiwan has a surplus of college graduates, while the mainland is short of them. Two-thirds of the Taiwan students in the United States remain after they get their degrees. What a shame Chinese minds cannot serve the Chinese nation. At a 1981 Asian-American conference in Chicago, a Japanese-American scholar reported that the third and fourth generation Japanese descendants in the United States typically identified themselves as American citizens, and didn’t want to be referred to as Japanese. I was glad to get a chance to check the validity of this statement when Russell, a medical student, took me to a Japanese-American-sponsored concert at Northwestern University in Evanston. Two-thirds of the audience were Japanese, and Russell knew some of them. After the concert he asked three young Japanese, a man and two women, to go out with us for a bite to eat. This was the first time I had sat down with young Japanese-Americans and what the scholar had said at the conference was fresh on my mind. The two Japanese women were sansei (third generation). I asked the Japanese-American man, Tom, which generation he was. He was yonsei (fourth generation). I also asked him how he felt about living in the United States, since he was, according to the report, one-hundred-percent American. “Of course I feel different. I am Japanese,” he said in a soft-spoken manner. “Do you have many American friends?” I asked. “Yes, I have American friends. But most of the time we associate with each other.” I knew by “each other” that Tom meant with other Japanese. “He’s great,” Tom answered. The two women laughed and the one next to Russell put her arm around his neck—a gesture most orientals would be unlikely to use. “I like Japanese women. They’re cute,” Russell teased. I, too, found this true. I made many American friends who were very helpful and friendly to me, but I didn’t feel comfortable saying to them the things I could say to even my casual Chinese acquaintances. There seemed to be a gap, a lack of a common understanding that is difficult to describe.